Are you always wearing black eyeliner? 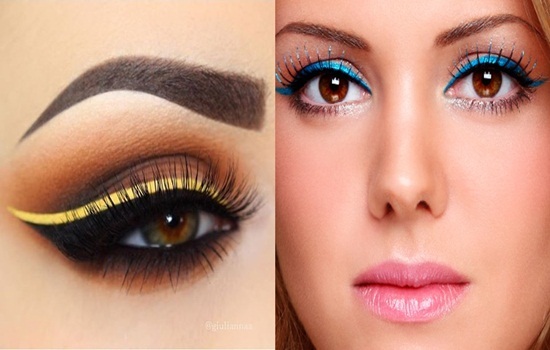 While black eyeliner is marvelously beautiful, the fashion market today offer a wide host of other colors that can complement your makeup and bring out the fashionista in you, brown, white, green, pink, purple and too many other options to experiment with, but you must know the essential tips to get it correct otherwise the look may turn from gorgeous to gross. Here are the basic tips to put colored eyeliner correctly. 1- Pick The Right Color. Now that you are going to try new eyeliner colors, it is important to pick a color that compliment your facial features and especially your eyes as well as the rest of your makeup, don’t make the mistake of picking your favorite color that may not suit the shape or color of your eyes. For beginners here’s a guideline, deep purple goes well with green eyes, purple and deep rose compliment nicely hazel eyes, olive green bring out the best of brown eyes and deep blow suits well blue eyes. 2- Keep The Rest Of The Look Simple. When you try colored eyeliner, it is recommended to keep the rest of the look simple, your eyes with the colored eyeliner will be the attention grabber in your look, overly done lips will throw that look away, so keep your lips looking relatively simple. As the market for colored eyeliner continuously expands, so does the market for eye shadow, to balance the look, use dark brown or black eyeliner on the top and a splash of colored eyeliner on the bottom, and if you are using colored eyeliner then use bronze, gold or silver shades of eye shadow rather than stronger colors. 4- Stay With The Safe Colors. When it comes to picking your colored eyeliner, stay with the safe colors like dark blue, purple and green, other colors like yellow, orange and red should be avoided unless you are attending a bizarre costume party, keep it in your mind that dark colors continue to be preferred when it comes to eyeliners. 5- Use Eye shadow First. If you will use eye shadow which you should to emphasize the look, then apply it first before the eyeliner, eye shadow will make both eyeliner and eye shadow last longer than they usually do. Complete the perfect look with mascara on the top and bottom lashes, resist the temptation to use colored mascara when you are already using colored eyeliner, traditional brown or black mascara will do the job. This Is Why You Should Start Including Sprouts To Your Diet.